Mike Essl A'96 was a partner at the award-winning design firm The Chopping Block, Inc., which he cofounded in 1996 with a fellow graduate of the Cooper Union. During his six years with the firm, Essl's clients included Sony, Nickelodeon, National Geographic, MTV, Intel, Microsoft, Roadrunner Records, the band They Might Be Giants, and the rapper Warren G. After receiving his MFA from Cranbrook Academy of Art, Essl went on to work for Columbia University, Chronicle Books, and DC Comics. 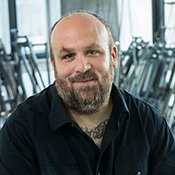 Essl has taught at Parsons School of Design, School of the Visual Arts, and is now an Associate Professor at the Cooper Union. Essl's work has been recognized in numerous publications and by the AIGA and the Art Directors Club. In 2003 his work with the Chopping Block was featured in the National Design Triennial. Essl was recently a juror for PDN Pix magazine as well as ID magazine's Media Design review. He also loves Mr. T.